Note: Defenseman John Nyberg was recalled from Idaho last night. It's a tale of two Texas Stars clubs as January rolls on. Monday's third period collapse marked the Stars' fourth straight loss, all on the road. If you are looking solely at the away ledger, Texas is 0-6-1 stretching back to an overtime win in Rockford back on December 15th. Without a road win in over a month, Texas is only keeping itself afloat in the standings when they could be surging ahead to secure a berth firmly. Indeed, this is the tale of two teams. At home, Texas is tied with Grand Rapids for the second-best home record in the league (.762, just a thousandth behind Bridgeport). On the road, you could easily mistake Texas for a club out of the running. At .375, they are the 6th worst club in the league when they hit the road. It's hard to say exactly what's going wrong. The Stars are arguably icing their best roster since opening night with the recent addition of Condra, Hintz, Gurianov and Carrick from Dallas. 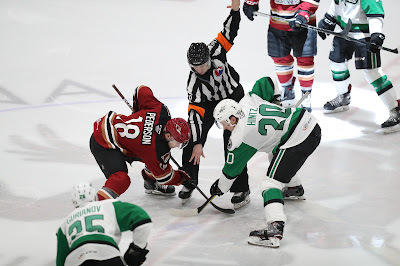 Rockford on Saturday was a goalie getting hot on the other side; Tucson on Monday was just one of those games that got away from the Stars. You aim for .500 hockey on the road and are elated with anything you can get above that. To that point, Texas should have had the first two game of this trip. Landon Bow did his job in stopping all but two shots, usually enough to win in this league. The offense just couldn't activate. On Monday, the offense was clicking but Bow had an off game. Everything needs to come together on the same night to have success. If Texas can get their offense and defense going on the same night, they've got a good chance against any team in the league home or away. Tonight's game is the last of their trip and has a chance to send them into their home stand weekend with some momentum.